With beautiful Sunset Beach only a few minutes' drive away, and so many different attractions, shopping, and great restaurants nearby, sometimes its easy to overlook the simple pleasures available right on our doorstep. The grounds of Sunset Village are beautifully landscaped, with several large water features, one of which is right by our building. Besides being nice to look at, the ponds in Sunset Village are also well-stocked with fish, of which the constant visits by local wading birds (mostly Egrets and Great Blue Herons) provide delightful evidence. However, fishing is not limited to the wildlife. 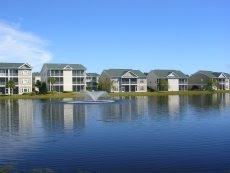 Sunset Village ponds are also open for fishing to residents and their guests. You can get an inexpensive fishing rod (a simple bamboo pole, complete with line and hook is less than $5 at the Walmart in nearby Shallotte), use a piece of bread or canned corn as bait, and you've got everything you need for an enjoyable afternoon. We have provided some folding chairs and a spare fishing pole and net in the outdoor storage closet for our guests to use. Oh, and be prepared for a lot of turtles to take a great deal of interest - particularly if you happen to throw handfuls of bread into the water. Just one handful, and the surface of the water will come alive with little turtle faces. I'm told that the Home Owners Association stocks the ponds with Tilapia every year, and we've caught other types as well (not sure what kind, but be careful of the spines on top). One of the many things I love about visiting the Sunset Beach area is that there are two wonderful institutions just a few minutes' drive from our condo - The Museum of Coastal Carolina, and the Ingram Planetarium. Throughout the Summer, each offers a full calendar of hands-on Family activities, which can be an excellent opportunity to have some fun learning new things with the kids. And Summer 2010 is looking good! In addition to a fantastic range of great shows in their state-of-the-art theatre, you can take advantages of a number of free events held regularly throughout the week at the Planetarium: On Tuesdays, try your hand at tools used for Celestial Navigation; on Wednesdays, come learn about Meet with members of Turtle Watch to learn about the Loggerhead Sea Turtle, and make Thursday your "Sun Fun Day" as you take a peek through a solar telescope. The Museum of Coastal Carolina offers a full week of special programs for the whole family, where you can learn a little extra about fish, or snakes, or prehistoric sharks, beach safety - or perhaps you'd like to learn about local ghost stories or brush up on your knot-tying skills. Nearby Barefoot Landing in North Myrtle, South Carolina. On one of our little outings while staying at the condo in Sunset Beach, we decided to do a short drive over the state border and visit some attractions in North Myrtle Beach. One of our intended destinations was Barefoot Landing, which I found out later is the only shopping/dining attraction located on the Intracoastal Waterway on the Grand Strand. Definitely not your run-of-the-mill shopping strip. No wonder I liked it! Now, I should tell you I am not a big fan of large shopping centers and malls. I'd rather stay away from the crowds, the big echoing atriums, and the parking lots - particularly when I am on vacation in order to relax. But Barefoot Landing was a breath of fresh air. I'm not sure how, but they have managed to make a collection of more than 100 specialty and retail shops, over a dozen different restaurants, and several entertainment and large musical venues, seem quaint and village-like. Perhaps it's the pretty red-roofed cottage-like buildings, and the way they are arranged along-side the water (making for a wide selection of water-front dining in one place), which made it so appealing a place to be? Floating boardwalks span the Waterway that splits the shopping center in two, and we enjoyed the cool breezes blowing off the water while lingering to feed the absolutely huge fish that crowded up along its sides. We watched a Cormorant as it repeatedly dove under water, hunting for fish; and made a game of re-spotting it each time it popped up again, always a surprisingly long distance from where it last ducked under. Of course, no trip to the beach is complete without a visit to your local Christmas shop for a tree ornament to commemorate your vacation; and Barefoot Landing obliges with a very nice Christmas Mouse shop. My daughter was also extremely pleased to discover a generous number of toy stores (which, for a five-year-old in the company of grandparents, is total bliss). One useful tip: Before you go, remember to look through one of the local free coupon books for a Barefoot Landing discount card, as they are accepted in many of the shops located there. Also, whenever any of us started to feel a little fatigued from the shopping, there was always a quiet little area in which to sit and relax awhile. My favorite was a little rock garden featuring water cascading down its center, surrounded by wooden benches. Definitely a nice place at which to while away a lazy afternoon. We will definitely make a point of returning during our next vacation in Sunset Beach, so we can take in a show, ride the carousel or maybe visit the tigers. Fresh from our lovely week in Sunset Beach, I have been reflecting on the many fun things we got to do. Yes, there was plenty of rest and relaxation by the fountain, out on the beach, and poking around the boutiques in town; but we also took a little time for an easy drive over into busy and bustling Myrtle Beach, SC, for some excitement. My daughter (now 5 years old) is currently fascinated with animals, so our family trips usually must include a visit to some sort of zoo. And there are several fine options to chose from nearby. 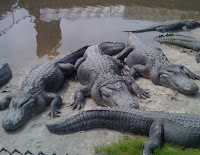 After just a 30-minute drive straight down US-17 South, we arrived at Alligator Adventure in North Myrtle Beach. The entrance to the parking lot is right on the busy four-lane road, and I was afraid at first that we were wasting our time with a tacky roadside attraction. But once we passed through the buildings that form the gateway into the park itself, the noise of the traffic was muffled by the high walls and lush vegetation; and it suddenly felt like we were a long way from anything urban. Alligator Adventure is home to more than 800 alligators, most all of which can be easily viewed by kids (no matter how short) and adults alike as you stroll over broad wooden decking throughout the park. We were pleased to catch the feeding time for the alligators, and learned many interesting facts about their habits from the well-informed caretakers in charge of the spectacle. In addition to their wide-ranging selection of both alligators and crocodiles (and let's not forget snakes, frogs & lizards) from all over the world, we were treated to close-up encounters with some fuzzier creatures as well. We watched a very energetic Beaver busily inspecting his dam, waved hello to a baby Zebra, and stood just feet away from two enormous tigers "huffing" (their version of purring) softly while rubbing their heads against the chain link fence like two friendly and enormous kittens. And then there were the exotic birds, albino alligators, ring-tailed lemurs, and brilliantly-colored frogs . . . but the high point of the entire visit for me was Gabby! 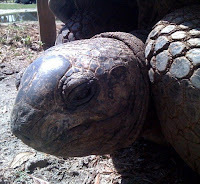 Gabby is a 52-year old, 450-pound, Galapagos Tortoise, and the sweetest-natured creature in the place. I t is said that the caretaker in charge of the tortoises there describes them as "puppies with shells." Gabby was one of a group of about 5 tortoises hanging out together with nothing between them and us but a single low rope suspended a foot off the ground with a few stakes. Obviously your average tortoise isn't much of a flight risk, but I wasn't prepared for how close we were allowed to get. And Gabby, obviously the most gregarious of the bunch, wanted to be close! She had parked herself firmly against the straining rope, like a friendly boulder, waiting for a pat. As Emily and I cautiously patted her head, she stretched her neck out longer so we could continue stroking down it towards her shoulders, while she gazed at us impassively with her watery brown eyes. I have never felt more affectionate towards a reptile in my life! I could have sat and petted Gabby the whole day long, but everyone else was getting hungry for lunch; so we said goodbye until our next vacation. We could have stayed for a hot meal in the park, but Alligator Adventure is right next to the famous Barefoot Landing, a shopping, dining and entertainment destination worth a blog post of its own. Keep your eyes on this spot. I'll have the next article written in a bit. This particular installment on our Sunset Beach Bliss Blog is the result of "on the scene" reporting. In fact, I have just returned to our condo from an exploratory visit to nearby Silver Coast Winery (about a 15-min drive from our place). The Sunset Beach area seems such a sleepy little place at first glance, but we keep finding very pleasant surprises like this Winery very near to us. 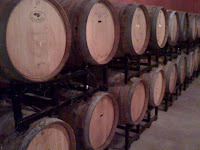 And a tasting at Silver Coast made it plain to us that it is run by folks who are masters at their craft. Like many others comprising the newly borne wine industry of North Carolina, Silver Coast Winery has made the South their new frontier, using our treasure trove of unique soils and excellent grape growing weather with skilled craftsmanship to fashion some very excellent wines. We tried all 10 of the wines currently available for tasting today, and guided through our journey by Amanda, a certified sommelier whose enthusiasm for fine wines and world travel fueled some very enjoyable conversations as we sniffed, swirled and sipped our way through a sublime array of flavors. So watch out, you may find yourself making an unplanned purchase of a case. Fortunately, their wines are very reasonably priced, particularly after the discounts offered with a purchase of tasting. An excellent afternoon out. Toss Those Golf Clubs Into Your Cessna, And Fly To Sunset Beach! Another great thing about the Sunset Beach area is that it is rich with options for those who'd rather fly than drive in. Not only is our condo only an hour from your choice of two International Airports (Myrtle Beach to our South and Wilmington to our North), plus the excellent facilities of the Brunswick County Airport, we have a fantastic municipal airport just 15 minutes down the road in nearby Ocean Isle: the Odell Williamson Municipal Airport. If you know a pilot - or if you ARE a pilot, then our area has all you need for a very satisfying journey to your beach & golf vacation destination. Odell Williamson Municipal Airport (formerly Ocean Isle airport) is owned by the Town of Ocean Isle and boasts a new FBO (completed just last summer), with facilities that include a 24-hour pilot lounge area with free wireless internet service. Their hard surface runway extends 4,000 feet, has a night lighting system, and is suitable for light aircraft. Self-service fuel is available on-site at Ocean Isle Beach Aviation, and is very reasonably-priced. Overnight tie-down service, as well as hangar storage are available; and, as of this writing, you can get one night's free tie-down with your fuel purchase. The folks at this airport are very friendly and helpful. They make a point to keep useful items on hand (things like a ladder for high-wing craft, a jumper box, a courtesy van, etc.) for their customers' convenience. If you are planning to fly in for a longer stay (Perhaps you have rented a lovely golf villa in nearby Sunset Beach? ), Hertz rental cars are available on-site - and Ocean Isle Beach Aviation also keeps a selection of their own rental cars. No plane of your own? Not to worry! You can also rent a plane at the airport - and learn how to fly it at their full flight school (see www.flyoib.com online for more details). Also charter flight services may be offered in the near future.